After enjoying a delicious first round of the cowboy slider burgers I sat back and tried to figure out how to make the leftovers even more delicious. I thought about it long and hard and couldn’t get it out of my head that the burgers would be perfect with french fries. They are baked and not fried! But they taste fried! 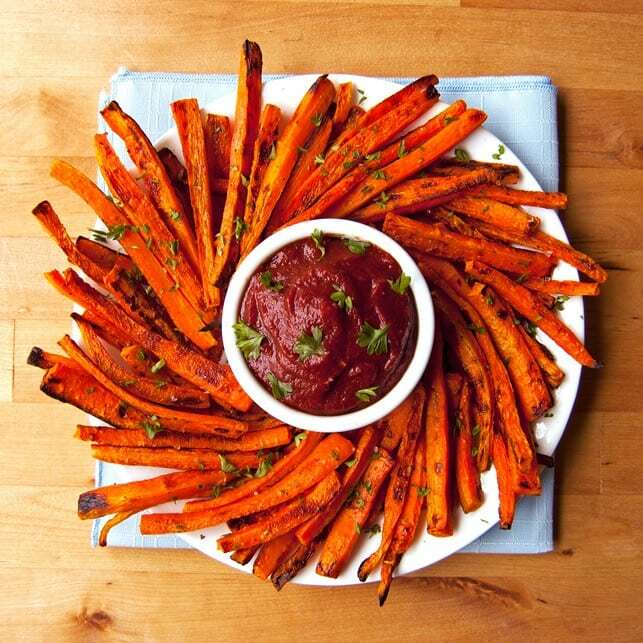 Guilt-free, and fried-free, fries that taste like delicious sweet potato fries! Hurray! They are made with carrots instead of potatoes, drastically cutting the calories, while remaining full of fiber and vitamins…can anyone say super night vision! Got to love those orange veggies full of beta-carotene! These baked carrot fries go perfect with homemade ketchup or any delicious dipping sauce of your choice! This photo is just screaming for some blooming onion sauce right now! Dig in to these dig-your-own baked carrot fries for a fried-tasting indulgence that’s guilt free! Baked carrot fries - With these guilt-free, vitamin-packed fries there is no need to sacrifice flavor for healthiness! No carrots? 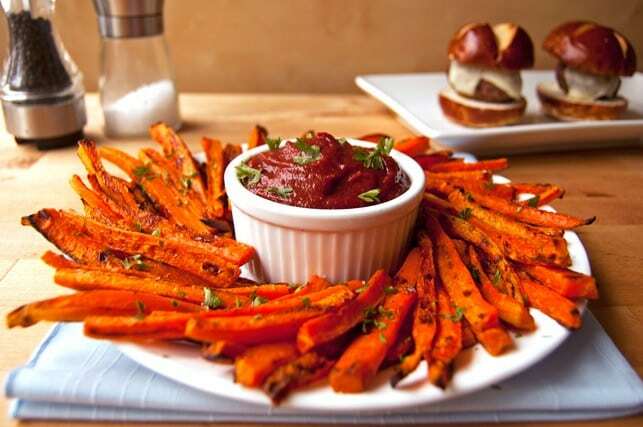 Try my Healthy Baked Sweet Potato Fries recipe. Peel and slice carrots into french fry shaped pieces (about ½” x ½” x 3”). 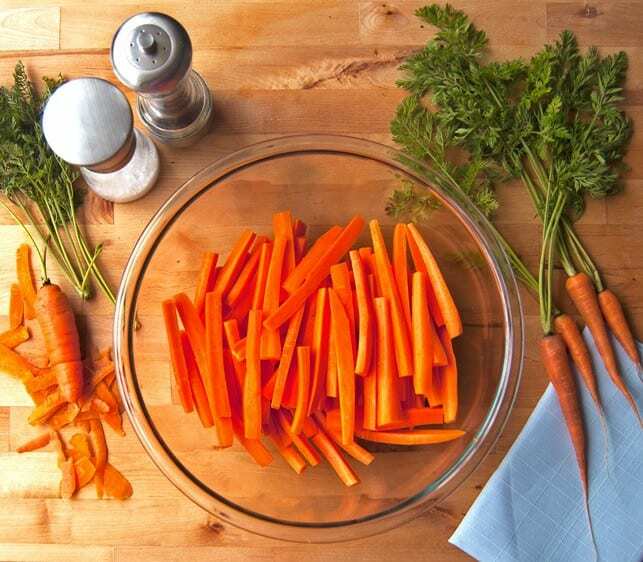 Toss carrots with olive oil, salt and pepper. 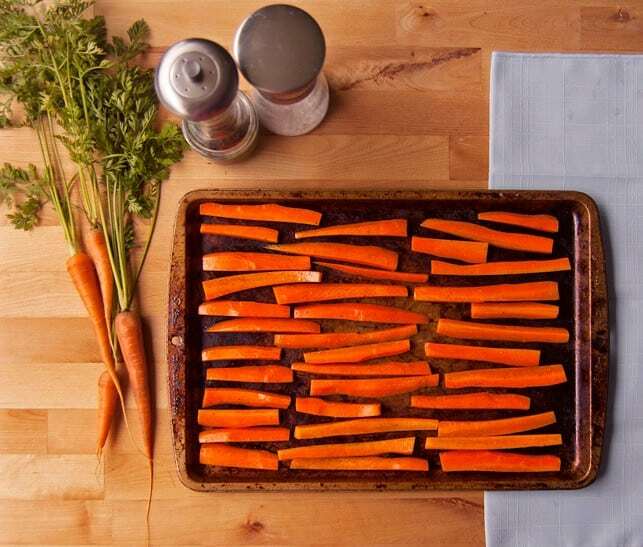 Arrange carrots in a single layer on baking sheet. Bake for 10 minutes then flip each carrot fry. Continue to bake until fully cooked and slightly crispy, about an additional 10 minutes. Serve immediately with your favorite sauce! $25 degrees celsius or fahrenheit? Thanks for reaching out with your question. The carrot fries should be baked at 425 degrees fahrenheit. Enjoy! Hi Jack! I’m happy you’re interested in the carrot fries – Let me know what you think once you give them a try! These fries are delicious! Thank you for sharing. I like homemade ketchup but I use a sauce made from veganaise (or reg. mayonnaise) Sriracha and a little honey. What a wonderful way to prepare carrots. We all really enjoyed this dish. I was a little skeptical that the carrots would be tender enough after only 20 minutes of baking time, but it worked out quite well. Thank for you for sharing your recipe, littlemafia. Made for the “Best of 2011” tag game. 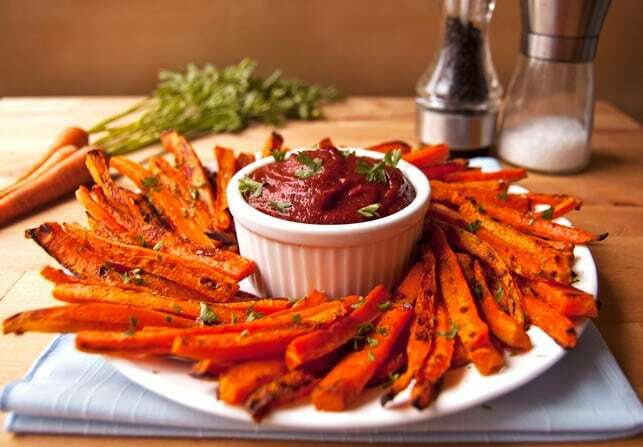 A variation of this great idea is carrot AND sweet potato fries (nicely arranged next to each other) tossed in olive oil, garlic and herbs, with home made blender salsa. Mmm, salsa. I have carrots in the fridge, can’t wait to make carrot fries tomorrow . I made these, and they were yummy! Followers, give these a try, you want be sorry. The baby carrots are even better, because they are a little sweeter in taste. Yum!!! HI! I found out about carrot fries by reading it online on a review, and I never thought this was even possible! So after researching the recipe online I stumbled across your food blog! I read the story and recipe and I got one question… do the carrots need to be from a “pick-your-own” garden, or can you buy the ones they sell at the supermarket? Sorry to sound to silly but, I am a health nut and would so love to try this and picking my own is not an option right now, but I’m still dreaming of someday have my own garden where I can pick my own veggies, LOL! Do you think these could be froze after cooking, for future use? I was hoping to make up a big batch for my toddler, and take out one serving at a time. Thanks! I would try reheating them in your airfryer for 2-3 minutes. They should crisp up nicely. Great idea – Thanks for sharing the tip Maggie! Can I use a photo and your recipe for an Infographic I am making? I would site your at the bottom of the infographic. This recipe is seriously so good. This is brilliant. I never would have thought of this in a million years. I’ve already shared the link with a lot of friends. Thank you for such a wonderful idea. Simple and delicious, but I had no idea you could do this until now. 🙂 Great idea! Hello Karen, the carrot fries sound yummy!! I cannot wait to try them. How do I find other recipes of yours? Mine are currently in the oven!! They will be ready in 15 mins! I can’t wait to try them!!! Not much of a cook, just learning. What do you mean by flip them? Do I bake ten minutes, stop, flip the carrot fries over and bake another ten, or stop at five minutes and flip, or what? Hi Hank, Thanks for stopping by the site and asking your questions. You totally got it right – cook the carrots for 10 minutes, flip, then cook for an additional 10 minutes. I’ve also updated the recipe to be more clear. Good luck with your culinary adventures! One last question, I’m planning on making these tomorrow but the only carrots I have our baby cut (not baby carrots, just carrots with a baby cut). If I use these instead will it effect the taste? Hi Hank! Thanks for reaching out again. I think baby-cut carrots will work fine for the recipe. You just might want to cut them into thinner sticks to get them crispier. Good luck and let me know how they turn out! I loved the idea! I wanted to ask though, are these chips crispy? This was excellent!!!! Thank you!! Your blog is so cute! I am definitely a new follower! Great idea! I have nominated you for a Liebster Award! 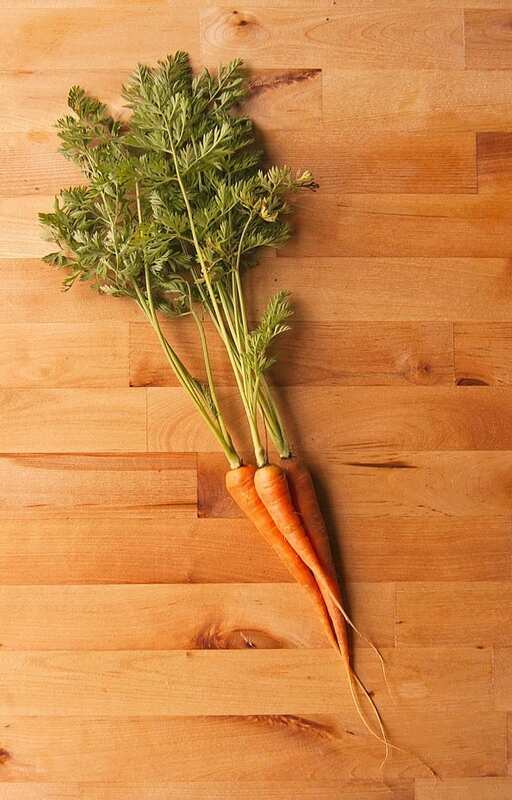 What an interesting and simple use for wholesome carrots! Thanks for the idea!